Semi-finalists will be chosen from a panel of industry experts and published online on August 2nd. They will then receive a photo shoot assignment that will be considered for publication in the 13th Annual Avant Guardian Issue and have access to the magazine's professional resources (stylists, designer collections, studios) for their work. Eligible candidates should not have had an editorial published prior to submitting, and must be a resident of the United States. 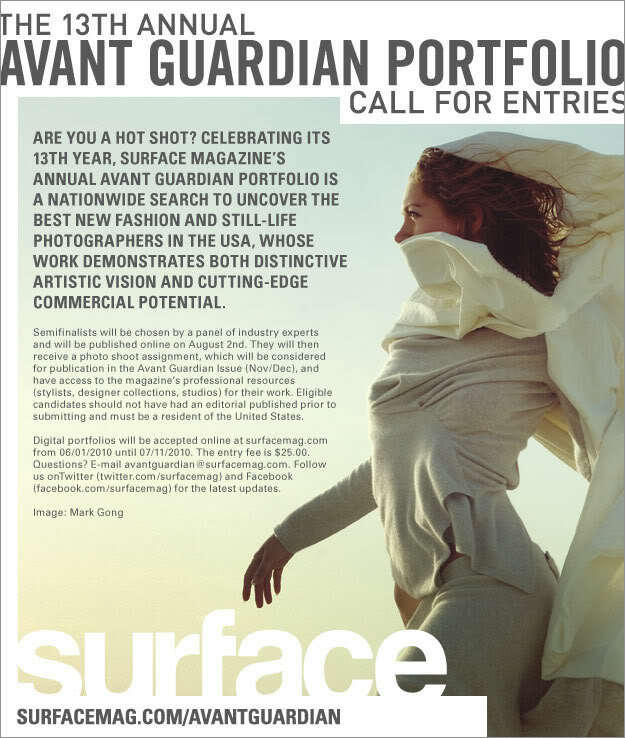 Digital portfolios will be accepted online at surfacemag.com from 06/01/2010 until 07/11/2010. The entry fee is $25.00. You may enter a maximum of 10 images for consideration; we recommend a minimum of three images. If you're not too familiar with the aesthetics of Surface Magazine, we found these short films to help you get a better idea on how to approach the contest: One, is in a form of surrealism and filmed in black and white from last year-- in collaboration with Black Market Productions called Dream Sequence, and the other is an old test shoot the magazine did all the way back in 2003.